Weston Super Mare's pier was a beacon for its tourism so what happened to the town when - like the recently devastated Fleetwood Pier - it was consumed by fire in July? Where there should be the sound of arcade machines and excited children's screams, there is an eerie silence, punctuated by the clanking of twisted metal. The proud centrepiece of the pier was reduced to a melted pile of metal in just over an hour by flames producing searing heat. "It's absolutely devastating. Every time I come up here, it doesn't get any easier," says owner Kerry Michael, as he leads the way through the wreckage. Go-kart steering wheels, melted carriages of the attraction's train, beer barrels and chairs poke out from the remains as a reminder of what once was. There are gaping holes in the pier's wooden floor - enough to make the hardiest stomach flip - although the main metal base structure survives intact. Mr Michael, whose childhood bedroom looked out onto the pier, had only bought it in February with his sister Michelle, and a £500,000 revamp had just been completed. He is determined to get it restored as soon as possible. Within days of the fire the surviving walkways and cafes reopened, attracting 15,000 visitors in one day. "We want to get on and fix it. We have to fix it. It's everything to the town. I can't look at it like this," he says, gesturing at the wrecked building with obvious distress. In fact, the pier has become a macabre tourist attraction, with a constant stream of people seeking a closer look and a photo. Rebuilding plans have begun and a brief for the Grade II-listed structure will soon be handed to architects. In meantime, the estimated 1,000 tonnes of steel and other debris will be cleared and a deck laid with temporary amusements. But clearing a structure which stands a quarter of a mile out to sea is a logistical nightmare. They have already rejected laying a train track down the pier, or installing cranes on the sand. After the fire it was rumoured the beach below the pier was littered with coins from its 370 different amusement machines. This was quickly denied by the authorities, but turned out to be true. Tens of thousands-of-pounds-worth of charred coins were recovered after the blaze, and the Bank of England has said it will honour their value. 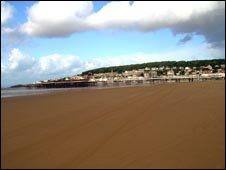 While it's hoped the pier will be rebuilt and even exceed its former glory by 2010, how will Weston fare until then? On a windswept day, it seems end-of-season quiet, with only a few hardy souls braving the beach or strolling along the prom. A couple of determined children clutch bright yellow spades, teenagers attempt a gusty game of cricket and a few people huddle round the seafront cafes in their anoraks, few opting for ice cream. Bored-looking donkeys take the opportunity to tuck into straw. This summer it seems the weather has been a greater enemy than the flames. 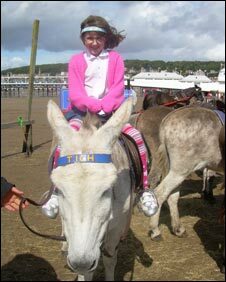 Kevin Mager's family has run the beach-based donkey rides and stalls since 1886. "It has affected the town and will do for a long time, until we can get the pier rebuilt," he says. "People are coming to look, but they're not coming to spend and they're not spending the day on the beach, which is what we need. Next year will probably be worse, as there'll be nothing for them to come here for." The lack of alternatives to the pier is a recurrent theme from business owners. Left on offer is the town museum, shopping centre and helicopter museum, while the Playhouse offers an evening with Gary Wilmot or celebrity psychic Sally Morgan. Chris Donkin has managed the SeaQuarium for seven years. He says the businesses feel they can struggle through the next couple of years, but need some hope on the horizon. "The pier owners have promised to make it bigger, brighter, better, put Weston back on the map." Weston is a favourite for day trippers, especially from Birmingham, with the M5 providing easy access. All seem determined to continue visiting, pier or no pier. Mike Davis, from the National Pier Society knows why these old structures are so important. "They're quintessentially British," he explains. "Everyone comes together on them. Kids love them, courting couples walk along them, older people sit and remember their younger days on them. There's nothing like piers." I spent 25 years of my life in W-s-M and the pier was such an intrinsic part of the town. I was horrified when I saw it going up in flames in a news bulletin on Australian TV. I do hope Mr Michael can get it rebuilt to its former glory, or even better. Weston without the pier just doesn't seem right. The longest pleasure pier in the world (Southend) seemed to have a curse attached to it. The end burned down, it was hit by a variety of ships, the huge bowling alley at the beach section then burned down, and then the end caught fire again. Every time it burns the news reports stretch all the way to Australia. Yet people still walk it, catch the "toaster" trains, get the view from the end. It's still loved by the locals - though seemingly not by the council. Which is more culpable, the fire-setting of malicious vandals, or the entirely predictable consequences of decades of civic neglect? Could there be a more accurate and poignant symbol of contemporary Britain than the image of a burned-out seaside pier? The burnt out West Pier in Brighton has become a bit of an attraction in itself, appearing on numerous pictures, calendars, and postcards sold around town. It is a massive shame to see something with a big social history burn down and I feel for those affected, but even the bleakest of clouds have silver linings. We have three piers in Blackpool - all listed buildings - all absolute eyesores. Blackpool's version of listed building status must be different to everyone else's - it's just an extension of the tat from the seafront. The quickest way for this Government to return to popularity is for them to scale back spending on Olympic-related gravy-trains, and to invest it in re-building the country's seaside piers. They produce more sense of community than a million elitist stadia ever will. Piers are a tired reminder of an irrelevant age. Would we dream of erecting giant ironwork structures in the middle of national parks - complete with candy floss stalls, amusement arcades, dilapidated pubs, and dreadful cafes? What class! Why we desecrate our coast in this fashion is beyond me as is the notion of spending millions resurrecting the anachronisms. No other country "treats" its coast to such impoverished imaginings. Long may our piers continue to be despoiled by the conflagrations they so richly deserve. "There's nothing like piers" - thank heavens for small mercies.